The beauty of camping is that it brings you in touch with nature. Whether you love camping in the bushes or prefer discovering the wilderness, whatever your dose is, camping is good for the mind, body and soul. Is it not beautiful to get away from the daily hustle and bustle of our busy lives and get some time to enjoy nature? Of course it is! You are probably a camping type of person or maybe you are just trying to adventure into camping. Well, one of the things that you will definitely need is a paracord grenade. This will most assuredly make your life much easier on your camping trip. No, it is not a real grenade. It is a survival kit that has the shape of a grenade. If you are looking for the best, easy to carry survival kit, this is definitely what you should go for. There are a variety of survival kits in the market from which you can choose. However, the Paracord survival grenade is what everyone is talking about currently. Not just because it is shaped like a grenade (this, of course, makes it more intriguing), everyone is haywire about it because it is a quality pocket survival kit. A lot of kits do not have the appropriate things that you need when you go camping. 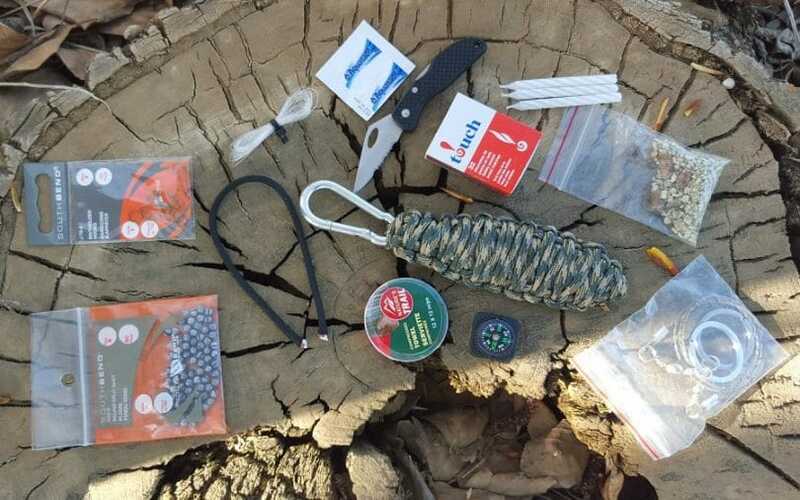 On the other hand, this survival kit has a variety of tools such a fire starter, knife among others that help you be ready for any situation which you may encounter during your camping adventure. You can even sew your clothes if they get torn along the way. How convenient is that! The survival kit is made up of paracord which can be unknotted to make longer threads of rope which then can be used to stitch, make lashings, fishing nets among other items that you might need on your trip. It is a multipurpose survival kit. There is nothing like being too prepared for camping. You most definitely want a survival kit that has everything you will need during your adventure. This survival kit is very portable and easy to carry; it practically fits in your palm, vest or you can even carry it your jacket. You can as well easily hang it on your belt using the carabiner that is provided or you can have it hang on your backpack. One of the things that you need most when you go camping is a shelter. The paracord is just perfect for making shelter when you have to spend a few nights in the wilderness. Imagine a cold night in the desert. Frightening, right? The paracord survival kit is equipped with matches which means you can easily start a fire when you need to. It also has a compass that works perfectly. The compass has a clip-on button positioned on the outside of the kit. Having a water purifier is essential especially when you have to extend your camp time for any reason. This means that you might have to find alternative means to purify the water you may find while in your camp. This survival kit has a powder that can be used to purify water making it very ideal for your camping trip. The powder can purify at least a litre of water. The survival kit also has a coffee filter which can filter muddy water. You can alternatively tear apart the coffee filter and use it as twigs to start a fire. You can at the same time use an aluminium foil to cook a meal. Oh, so you’d love some fish? It has a 25 feet fishing line, perfect for this purpose. You can also check out our tips on how to make a survival water filter for your needs. While most survival kits lack first aid supplies and bandages, the Paracord survival grenade makes it easy to treat any wounds you may get while in the wild. You are assured that your wounds, no matter how small, will not get infected or prevent you from enjoying the remaining part of your camping trip. Running out of food? The snare has got you covered. Unlike other survival kits which never include a snare, you are assured of one that you can use to capture small game for your meals (just make sure you practise how to use snares if you intend on using one while on camp). 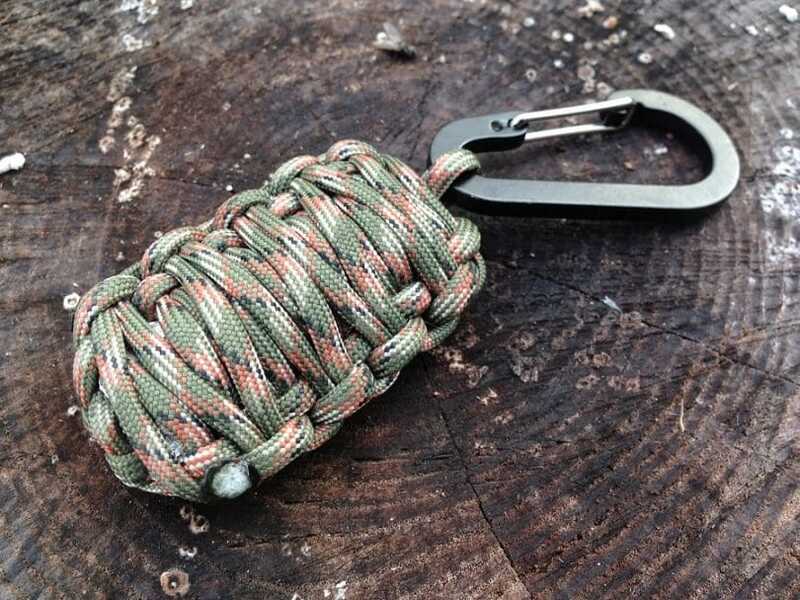 See our easy guide on how to make a duck-call paracord lanyard when you’re hunting for food. The paracord survival grenade comes in different colours; you can have the satisfaction of choosing your favourite one. If you are still having doubts on whether to get the paracord or nylon cord, here is your answer. 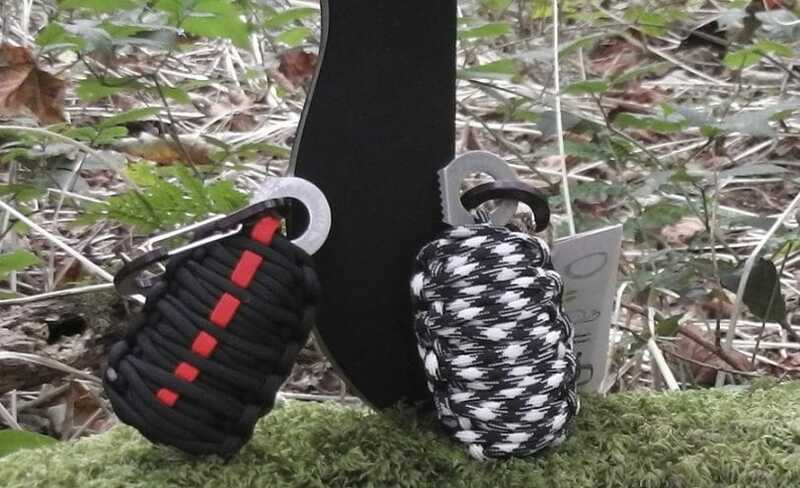 Paracord gives you a variety of options when it comes to improvising when you are camping. The best part is that you have two options when it comes to this survival kit. You can buy a readymade Paracord survival grenade or make one yourself. No, it is not a tedious process. It is a simple process and you will definitely have fun at. Practice makes perfect, do not beat yourself up if it does not come out as perfectly as you would want it the first time. Keep practising and you just might end up being an expert at it. All you need are a few supplies and you are good to get started. I will take you through the simple steps that you can use to make your Paracord Survival grenade. Don’t worry, by the end of it, you will be teaching others! There is nothing as fulfilling as being able to take control of your life even when you are in the middle of nowhere. Here is a list of the basic supplies needed to make your paracord survival grenade. You have to keep in mind the items that you would want to include in your survival kit. A knife or tool to cut the cord (you can include a razor or small blade). The blade ought to be sharp enough to cut game meat that you may hunt while on your adventure. Tinder. This will help you have your fire in not time. A tinfoil. This can help in preparing dinner, getting some water and even acting as a signal in incidences of an emergency. Bobbers make sure you catch the fish. Assembling the survival kit is a very simple process that will take just a few minutes of your time. The most important aspect is to make sure that you have all the items that are essential for your outdoor adventure. 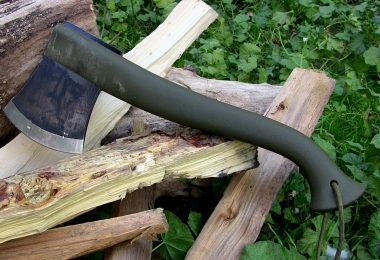 Make a list of the things you need in your survival kit so that you don’t forget a tool that you will need while in the wild. Take one piece of the paracord; you can determine the length according to the number of items you want to include in the grenade. Make sure to use at least three passes down and up using the cord. Fold the cord at the centre and attach it to the carabiner right at middle by the use of larks head knots. Place the survival items (in the tin foil) at the centre of the cords. 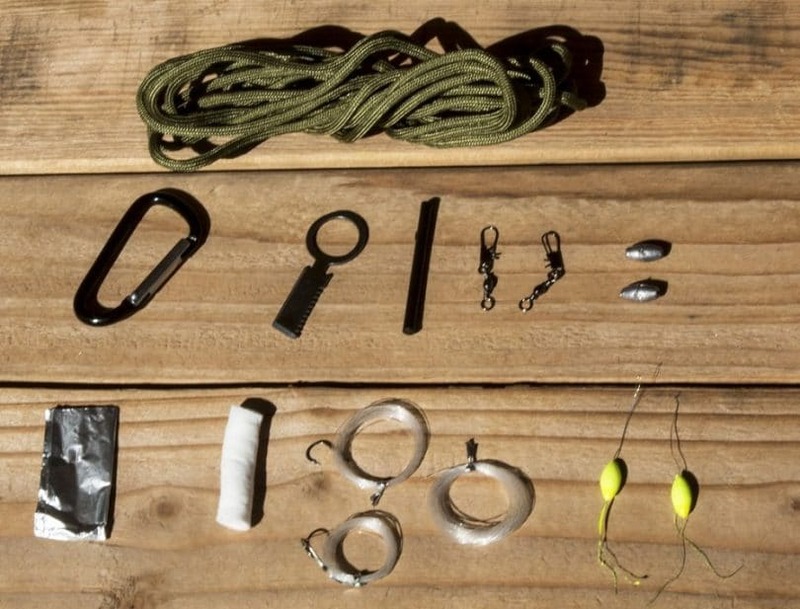 Cover the items with several cobra knots and there you have your ultimate survival kit. 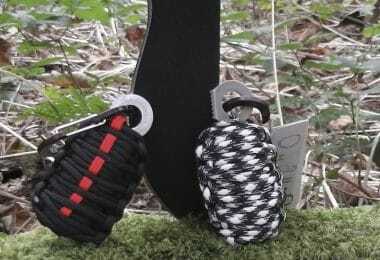 There are different types of survival kits that you can make using paracord or even buy. 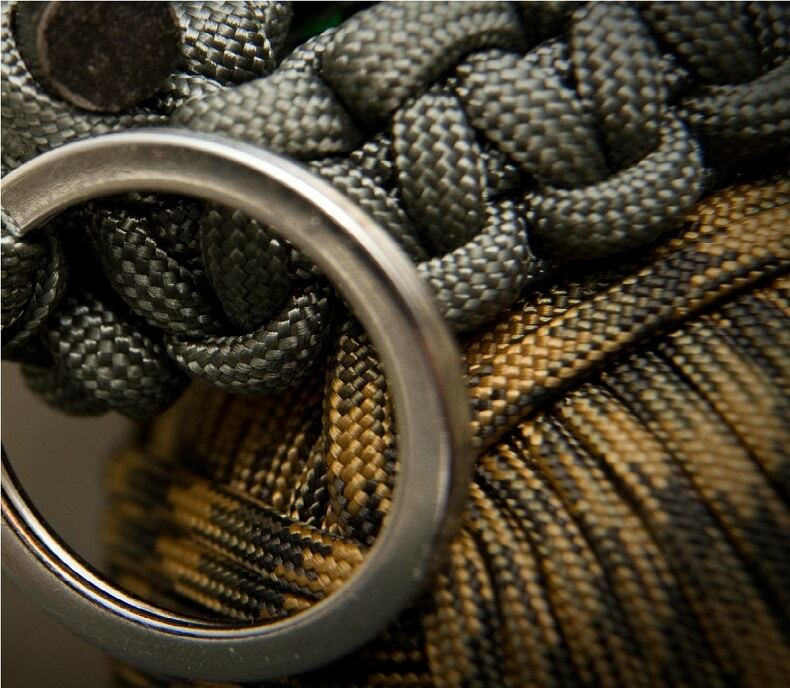 You can simply select your preferred paracord and order it online or buy from a store near you. 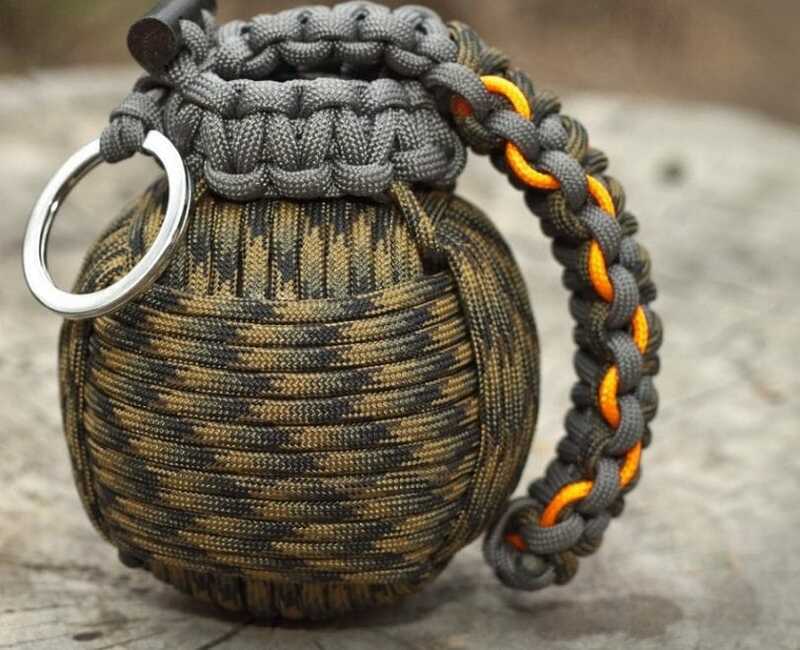 Below is a list of the various paracord grenades. This kit consists pretty much everything you need in the wild. It comes with a LED light which is a key requirement in the wild; it has four fishing hooks and four fishing weights; thread and needle, whistle buckle, safety pins, bobby pins, wire saw, aluminium foil, electrical tape, a compass, butterfly sutures, a can opener, a sharp blade, a small pocket knife, a handcuff key that is universal, four water purifying tablets, a striker and rod to start fire among other tools. This is one handy survival kit. Not only is it stylish, it is light, buoyant and waterproof. It is an attractive survival kit, uniquely designed and has a mix of grey and pink cord. Did I mention that it comes with a hand sanitizer (a bottle of 2.5 oz)? You do not have to worry about your health, it is all sorted out. Spend the time enjoying your adventure and let the sanitizer mind your health issues. This is one of the cool grenades to carry around on your escapade. This survival kit comes with over twenty-six tools. The colour is a mix of charcoal and yellow. It is an eye-catching piece and is easy to locate if you displace it. Similar to its counterparts, this grenade has all the essentials you would need on your trip. The top assembly is made up of a charcoal cord while the safety cord is orange in colour. The Deluxe paracord grenade is water tight and has every single tool that you require on any adventurous trip. It has a compass place just below the handle which means it can be used without necessarily deploying the survival kit. The kit has a fire rod which can be used to start a fire. The ferrocerium rod is attached externally near the lever which is linked to the plug. In case of an emergency you can use a steel blade alongside the ferrocerium rod to generate hot sparks which can start a fire. The survival kit comes packed with additional materials to help start a fire; these are just-twine which can be used as tinder and waterproof matches. 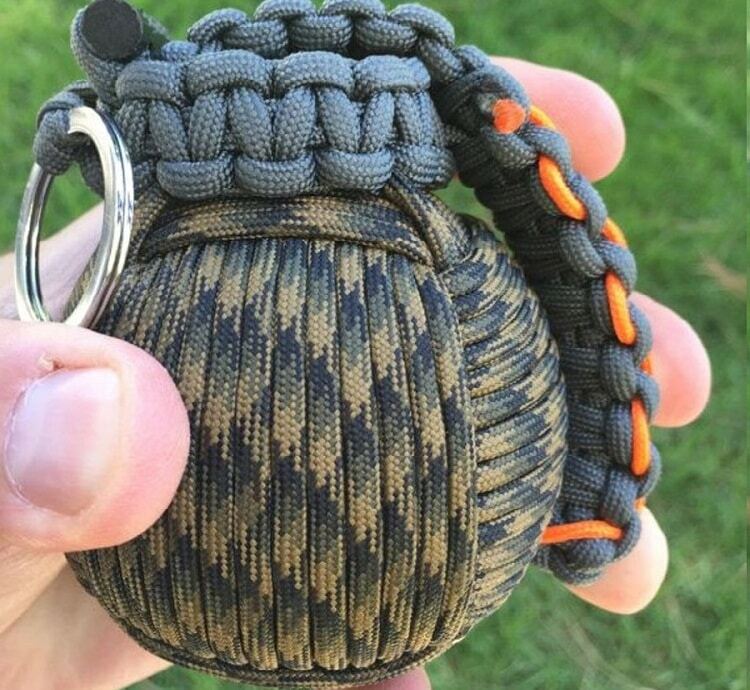 This paracord survival kit feels and looks like a hand grenade. If you want to feel like superman for some time, this is the survival kit you should get. It is pink in colour for that girlie look. You can get paracord survival kits in other various colours such as purple, coyote brown among others. It is important to keep in mind that once you deploy the paracord grenade survival kit you cannot reassemble it. It is paramount that you are always equipped with the best survival tools you can take with you anywhere and everywhere you go. It is better to have lifesaving tools at a hand’s reach rather than be sorry you did not have them. This is one of the most lightweight survival kits that you will have and it is what you must have on your next camping trip. 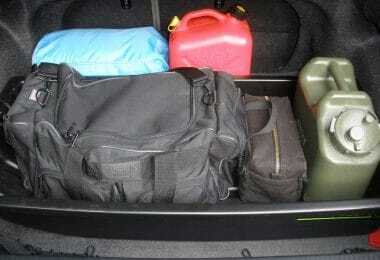 You can easily store the kit in your car in the emergency kit. This is one of the most useful kits that is easily portable, contains the most versatile and best tools that you would need on your outdoor adventure. If you are looking for the perfect gift for a friend in the military or one that loves hunting, camping, hiking and other outdoor activities in the wild, this is the survival kit you need to get them. If you find it too much work to make one for yourself you can always buy one at a pocket-friendly price. 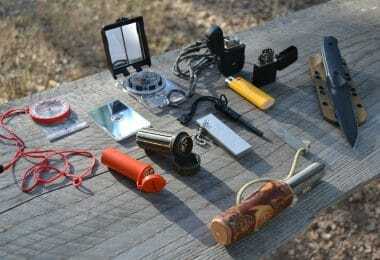 The parcord survival kit has an array of tools that you can use in any survival condition and in any kind of weather. The kit is made of quality components that will serve for a long period of time. Get value for your money by getting the ultimate survival kit that you can take with you anywhere you go. You can easily attach it your keys and you are good to go. 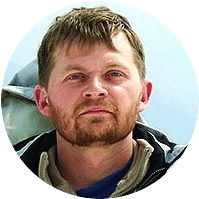 For more information on the many survival uses of the paracord, see our must-read article on this topic for reference.